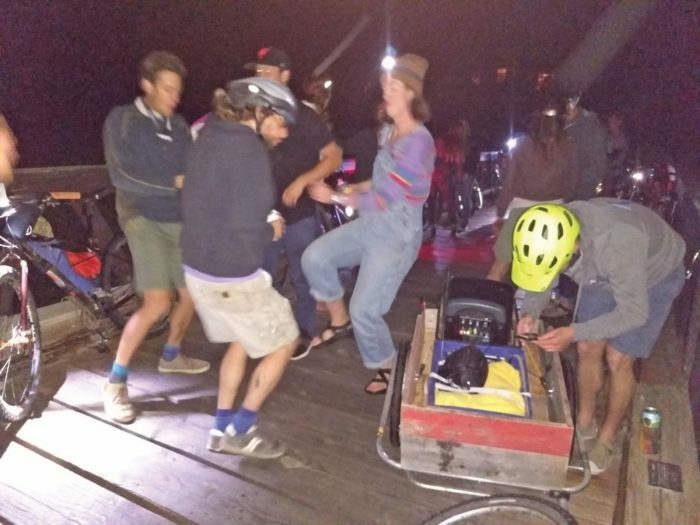 Carbondale’s Full Moon Cruise has waxed and waned, but if history is any guide, this month’s Mountain Fair ride is likely to prove particularly bright. The last time circumstances so aligned, hundreds of cyclists flooded Main Street right after the slideshow, breaking into several smaller groups that still outnumbered most successful months. Other nights, a dozen stalwart souls rode against the February chill, half the procession waited at the bottom of White Hill while others rode up or the whole crew stopped for an impromptu fire dancing display. “It’s never the same twice. That’s what’s cool about it,” said Spokes Man — an anonymous community member who has been involved since the very beginning. He thinks that was April 2005, and doesn’t believe that the original organizers took the idea from anywhere else. The anonymity isn’t just about liability, it’s an intentional attempt to keep things leaderless, as one of the Facebook group administrators — who identified himself as a robot “programmed to help Carbondale have as much fun as possible” — explained. Still, someone has to set a time to meet and keep the group together. “You’re kind of like a cowboy trying to get the herd to move,” Spokes Man observed. It helps to have someone with music up front, which has become easier in the era of bluetooth speakers and even inspired intermittent pauses for dance parties. It used to be dedicated to those who didn’t or couldn’t join, but the latter demographic will hopefully be limited, as at least one pedi-cab service will be available. Spokes Man is proud of the diversity the event has attracted — all ages, walks of life and types of bikes — and the way folks cheer as it passes. “It’s more of a community event,” he said. He’s glad to see a new generation taking on organization, and plans to pass on the Spokes Man (Woman / Person) title like the Dread Pirate Roberts. “It needs that youthful energy,” he said. The robotic heir apparent — we’ll call him Spoke Too Soon — hopes that doesn’t mean too much of a party atmosphere, particularly with the Friday of the Fair timing. If all goes well, the big ride might hook some new participants as it moves into its next phase.